I scream, you scream, we all scream for...Unicorns!! Oh YES, I totally went there! The world is fangirling over unicorns right now and I'm wholeheartedly right there with them. I can't get enough of all of these bright colors filling up my newsfeed. It reminds me of my childhood with Lisa Frank and My Little Pony. Even now, my closet is filled with florals, abstract, aztecs, tribal, and bohemian prints. If you ask me, the unicorn trend is far from over. With Frappes, cookies, and rainbow highlighters, it's no wonder we're head over heels for this trend. I'm happy to provide my part in all this color craze, but keeping the handmade touch, by designing a new pattern. 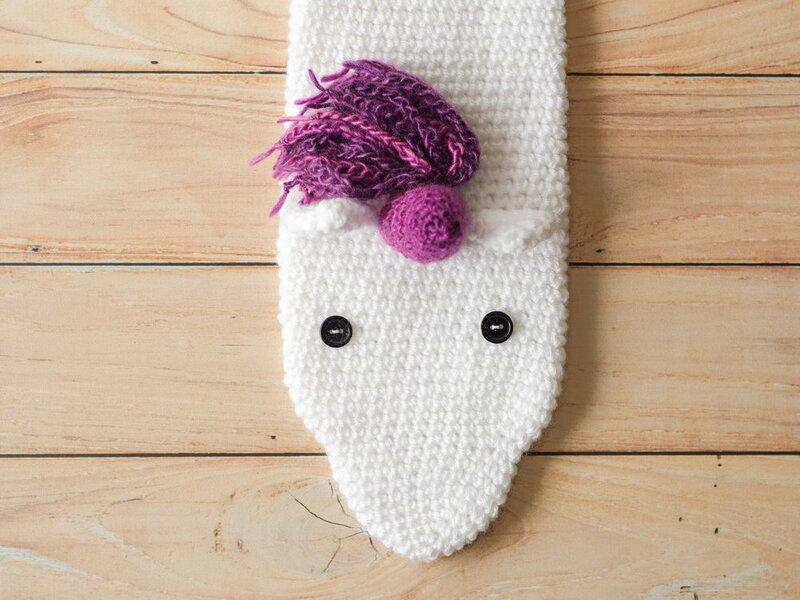 Begin your holiday/fall season by diving into a whimsical fairytale with this free crochet pattern, Unicorn Scarf. This crochet pattern is worked in a continuous circle. Do not chain at the beginning of a round (unless otherwise stated). Do not join at the end of each round (unless otherwise stated). I would recommend using a stitch marker at the beginning of each row. 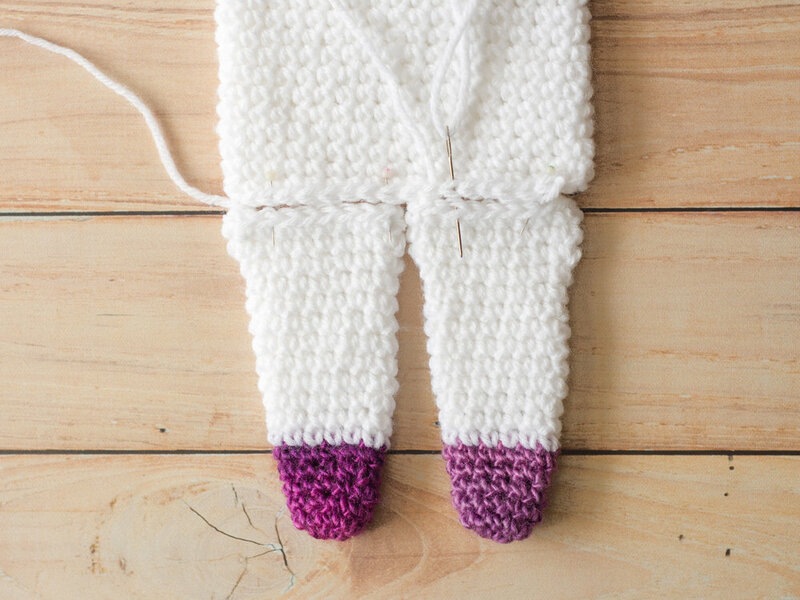 This crochet pattern is worked from the nose/head to the back legs. Body Length (without legs) 24", Width 5", Circumference 10"
Tie off leaving a long tail. Sew the bottom of the body closed, weave in end. Make a total of four legs. Tie off leaving a long tail. Wip st to body (see pattern pointers). Using Red Heart Boutique Unforgettable yarn. Tightly ch 50. Tie off. Repeat a total of 12 times. Tie pieces together and attach to body (see pattern pointers). Using Red Heart Boutique Unforgettable yarn. Tightly ch 25. Tie off. Repeat a total of 12 times. This is what the body of the scarf should look like. You may have more or less rounds depending on your gauge and yarn thickness. Attach the eyes between rows 17 and 18, with 8 sts between the two eyes. Attach the ears in between rows 24 and 25, with 6 sts between the two ears. Attach the horn directly in between the two ears. Holding the 12 strands together, use a piece of yarn to tie them into one bundle. Fold the bundle in half and attach the mane directly behind the horn. Turn the body upside down. Attach the legs between rows 30-34, slightly crooked, so they stick out from the body at an angle. Line both legs up with the bottom of the scarf. Using stitch markers (or pins) for added placement help, attach the legs to the bottom of the body. Holding the 12 strands together, use a piece of yarn to tie them into one bundle. Fold the bundle in half and attach the tail 5 rows up from the bottom, and in the middle of the legs. I'm the Blogger. Designer. Editor, and stylist behind Semi Sweet Crafter.